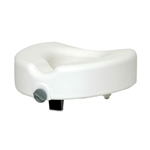 Invacare Raised Toilet seat with arms and lock PB408. Locking toilet seat riser with arms. Elevated toilet seat.